The current UK employment rate is currently estimated to be 76.1%, the highest figure on record. The UK unemployment rate is 3.9%, the lowest since November 1974. These are encouraging figures if you are looking for a job as they make it a candidate market. But for companies with key vacancies and anyone involved in recruitment, these figures are more worrying. Having active and effective strategies to make sure your best employees don’t accept a competitor’s attractive offer is now more important than ever. 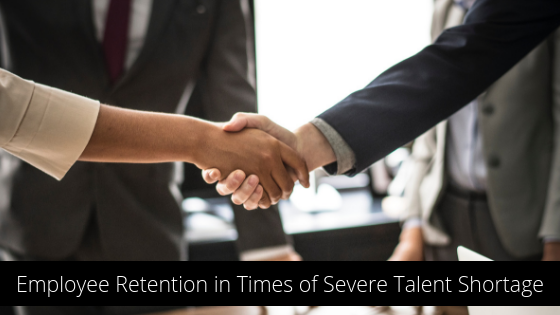 However, concentrating on employee retention is never a bad thing, and although it is probably what all business leaders should be prioritising right now, it is good practice to have a permanent retention policy in place. The cost of replacing an employee, according to the Society for Human Resource Management is about six to nine months of their salary, not to mention the disruption to output while a replacement is found. The best way to avoid the cost and inconvenience of losing a key employee, is to make sure they don’t want to leave in the first place. This may sound obvious, but often the focus in larger companies is how best to attract new talent – offering competitive salaries, generous benefits and flexible working while the existing employees who have been in their roles for a few years and may have missed reaping the rewards of a hot job market. They like their jobs and consistently perform well but are now starting to feel like an afterthought. Candidate attraction and employee engagement have now become equally important and of the highest priority. Of course, Internal Communications specialists will have been trying to get employee engagement centre stage long before there was a known talent shortage crisis, and will no doubt be delighted that it has finally become a priority. The most important aspect of employee engagement currently, according to recent research (IWG’s Global Workplace Survey) is workplace flexibility. As much as 80 per cent of those in the UK would choose a job which offered flexible working over a job that didn’t. Findings show that 71 per cent of businesses think that offering flexible working enables them to expand their talent pool. In fact, the research reveals that many (82 per cent) UK businesses are adapting to improve talent retention by introducing flexible working. From an employee’s point of view, a third said that flexible working is so important to them, they would prioritise it over having a more prestigious role. Another way to improve employee engagement and talent retention is the updating of the annual performance review, an increasingly outdated management technique. Employee appreciation should move to a year-round activity, where it becomes a spontaneous and therefore more genuine act. Other predictions in the employee retention space are that employers will take a much more holistic approach to wellness and gamification will be adopted more widely. Two very different areas of approach but equally valid. The role of mental health support in the workplace has taken up a lot of discussion amongst HR professionals recently and there have been some fantastic improvements in the workplace of openness and support. Gamification can and has been used for everything from wellness programmes to onboarding, and as the technology improves, so does the value for engagement. Walmart has recently adopted a simulation video game for employee training and another one for personal scheduling and other organisations are following suit – LinkedIn, Airbnb and Lyft all offer an executive level coaching app and Paychex released a web-based learning management system for employers. Recruit staff who will fit comfortably in to the culture and ethos of the organisation. Offer a competitive benefits package and salary to new and existing workers and keep updating it following staff consultations. Provide a comfortable and safe work environment and culture and make sure high standards are maintained. Offer training and make it easy to access. Be approachable and available and make sure everyone gets heard, even the quiet ones. Review and assess personal progress regularly. Recognise achievements as they happen. Showing appreciation and thanks can go a long way to making someone feel valued. Employees need to feel their bosses appreciate and care about them and they will be more engaged and motivated to help the company succeed as a result. They can also become great ambassadors and those organisations with a good reputation for being a great place to work are not going to find it difficult to recruit new staff, even in times of talent shortage. At Chapple we specialize in sourcing candidates in external and internal communications, employee engagement, change, HR and business transformation roles.